People have used art to persuade and protest in New Zealand since the 19th century. Visual artworks, songs, poetry and theatre have been employed to engage New Zealanders socially. 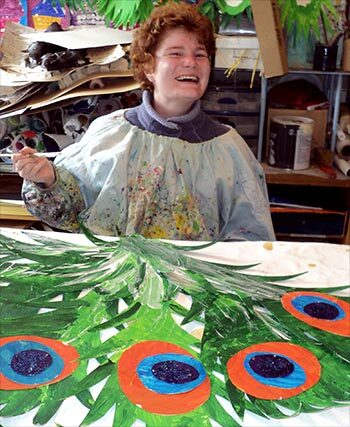 The arts are also used to help people with mental or physical disabilities. For many artists the production of artworks has had a social and cultural purpose. In early colonial paintings New Zealand’s rugged landscapes were sometimes changed to make them look more attractive to potential settlers from Britain. Māori employed art to protest the detrimental aspects of colonialism. Some Māori also composed waiata (songs) to protest the loss of their land and other injustices. Cartoons often satirised current events, but they were also used by some groups to promote social change. Unions were among the first to use art to build a collective identity and attract public support. When Māori rugby players were banned from the 1960 All Black tour of apartheid-era South Africa, Gerry Merito from the Howard Morrison Quartet wrote the song ‘My old man’s an All Black’ to protest the decision. From the 1970s artists increasingly questioned New Zealand’s idealised view of its race relations. The feminist movement sought to give women the same opportunities as men. Jacqueline Fahey’s paintings, for example, depicted the social isolation of suburban life. The environmental movement rose to prominence in the early 1970s following a government initiative to dam Lake Manapōuri for hydro-electricity. John Hanlon’s 1973 protest song ‘Damn the dam’ became popular. Artists such as Pat Hanly and Ralph Hotere used their art to protest environmental and political issues. Arts therapy is based on the belief that art practices and materials can help build, restore and maintain physical, mental and emotional wellbeing. It encompasses visual art making, drama, dance and movement. Music therapy is used to help people with disabilities and those who are socially isolated. In 2014 a number of non-government arts organisations advocated on behalf of people who experienced barriers to participating in the arts.